Paiste undertook a remarkable historical research project to make possible these accurate reproductions of the "lost" cymbal sounds of the 40s, 50s, and 60s, the golden era of blues, jazz, be-bop, and the big band. In loving detail, via research and consultation with historically experienced drummers, the new "Traditional" Line was created, making the full history of sounds from some of the most diverse cymbals (ride, hi-hat, splash, swish), once again available today! From sizzling big-band swing to the smoky intensity of bop and blues. 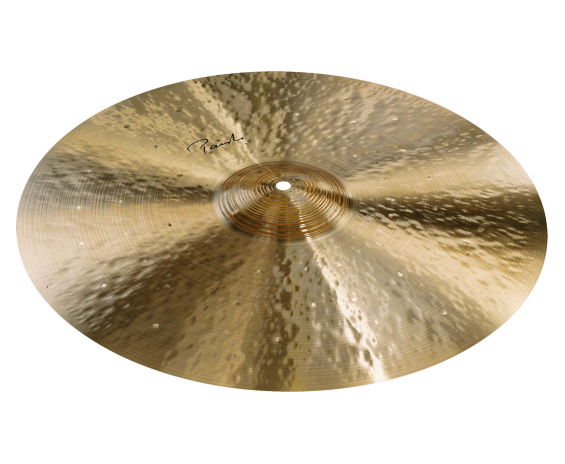 Unlike the delicate classics of that era, the "Traditional" cymbals offer a unique breadth of sound spectrum, versatility of expression, and the excellent durability of Paiste's patented sound alloy: the state-of-the-art bronze compound from which they are produced. These new instruments will impress collectors, music connoisseurs, and lovers of traditional cymbal sounds. The Light Ride of the Traditional Line is low in pitch, offering a buttery-soft playing feel. The ping has a woody, softly sparkling quality that merges with a complex, dark and somehow smoky sound. It opens up nicely when playing with the shoulder of the stick, dieing quickly away again, giving room to each stick attack. A short decay time returns control back to the player after some hard playing. The overall impression of the sound is akin to a dark cloud that gently ensnares the listener.